Heat the oil in a large skillet with a tight fitting lid over medium heat. Cook the onion with the salt, stirring for 5 minutes or until soft. Add spices. Cook 1 more minute. Add the sweet potato and coat in spice/onion mixture. Add the brown rice and vegetable stock. Increase heat to high and bring to a boil. Reduce heat to low and cook covered for 15 minutes, or until the rice is tender and liquid is almost absorbed. Add the kale and mix to combined. Remove from heat and let stand for 10 minutes. 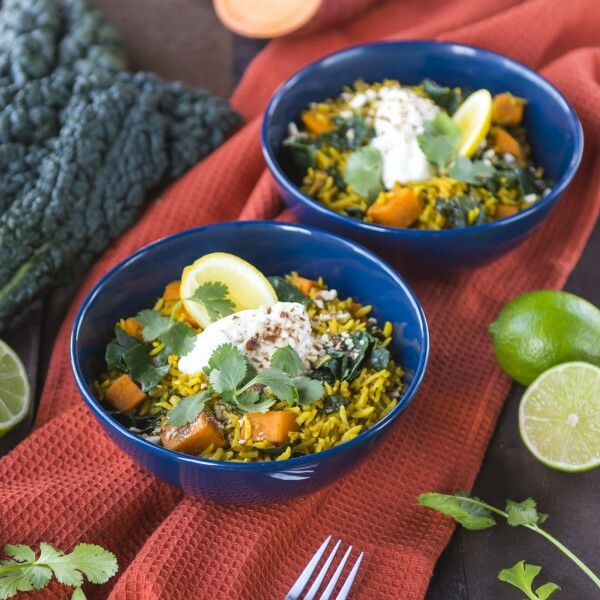 Serve in bowls with almonds, cilantro, and Greek Yogurt and lemon wedges.